Bumbu is the Indonesian word for spices mixture or seasoning, and it commonly appears in the names of certain spice mixtures, sauces and seasoning pastes. It is commonly found in Indonesian cuisine, which includes its regional variants such as Balinese, Javanese, Sundanese, Padang, Batak and Manado cuisines. It is spread over various meats, poultries, seafoods and vegetables; used in stews, soups, barbecue, sotos, gulais, and also as a common addition to Indonesian-style instant noodles. The practice of blending spices, herbs and seasonings is perhaps the most distinctive feature of Indonesian cuisine; it produce some of the most flavorful food in the world. Indonesians have developed original gastronomic themes with lemongrass and galangal, cardamom and chilies, tamarind and turmeric. The spice mixture are commonly made by slicing, chopping, grounding, beating, bruising or sometimes burning the spices, using traditional cooking tools such as stone pestle and mortar, to modern blender or food processor. The bumbu mixture usually were stir fried in hot cooking oil first to release its aroma, prior to adding main ingredient (meats, poultry, or fishes). The main function of bumbu is actually the same as common spices; as flavouring agent, to add, enrichen and/or to enhance taste and aroma. However, in tropical Indonesian climate, prior to the discovery of refrigeration technology, the cooking and preparing food through spicing was used to kill the dangerous microbes and to improve food safety. The spices used in Indonesian bumbus such as garlic, shallot, ginger and galangal that are used in rendang have antimicrobial properties and serve as natural organic preservatives. Some of spices are known to inhibit the growth of microbes. That is why if cooked properly, dry rendang can last for as long as four weeks and still safe to be consumed. It is important to note that each bumbu recipes use certain collection or combination of different spices. Kacang tanah (peanuts), fried, grounded, spiced and add water to make peanut sauce. Prepacked ready to use (just add water) satay, pecel or gado-gado peanut sauces are available in Asian grocery store. Bubuk kaldu (broth powder), similar to bouillon cube but in granular powder. In Indonesian cuisine there are myriad variations of bumbu spice mixture, divided according to each recipes and each regional cuisine traditions. 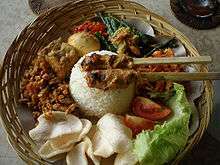 For example, Balinese cuisine recognize basa genep bumbu, while Minang cuisine recognize pemasak bumbu. However, there are four generic basic bumbu recognized in Indonesian cuisine divided according to its colours. Bumbu dasar putih (basic white bumbu), consists of ground shallot, garlic, galangal, candlenut and corriander, all are stir fried in coconut oil, use it right away or stored in a jar and put in refrigerator for further uses. It can be used in all Indonesian dishes that had whitish color, such as opor ayam, sayur lodeh, various soto, and only need to add Indonesian bay leaf, lemon leaf, and lemongrass. It can also used to cook rawon, semur, mie goreng, various stir fried vegetables, tofu and tempeh dishes. Bumbu dasar merah (basic red bumbu), consists of ground red chili pepper, shallot, garlic, tomato, burned shrimp paste, coconut sugar, salt, all are stir fried in coconut oil, use it right away or stored in a jar and put in refrigerator for further uses. It can be used for various Indonesian dishes that have reddish color such as various stir-fried vegetables, nasi goreng, sambal goreng hati, etc., only need to add daun salam (Indonesian bay leaf), bruised lemongrass and galangal. Bumbu dasar kuning (basic yellow bumbu), consist of ground shallot, garlic, sauteed candlenut, burned turmeric, coriander, ginger, galangal, black pepper, all are stir fried in coconut oil, use it right away or stored in a jar and put in refrigerator for further uses. It is used in various Indonesian dishes that have yellowish color, such as various soto, pepes, mie goreng and ayam goreng, sometimes acar kuning yellow bumbu are poured upon ikan bakar or ikan goreng. Bumbu dasar jingga/oranye (basic orange-colored bumbu), consists of ground red chili pepper, shallot, garlic, caraway, anise, coriander, candlenut, turmeric, ginger, galangal, black pepper, all are stir fried in coconut oil, use it right away or stored in a jar and put in refrigerator for further uses. It is used in various orange-colored Indonesian dishes, such as gulai, Indonesian curry, kalio and rendang. ↑ Kumar's Curries & Bumbus (2011). "Curries and Bumbus". Verstegen. Retrieved 2011-10-24. 1 2 Wina Wiroreno (16 March 2010). "Spice Up Your Life the Indonesian Way". My Cooking Without Borders. Retrieved 8 December 2015. ↑ "Indonesia: Spices". Global Gourmet. Retrieved 8 December 2015. ↑ "Herbs and Spices, The most important part of Indonesian cooking". Discover Java and Bali. Retrieved 8 December 2015. ↑ "Bumbu". Spices of India. ↑ "Bumbu Dasar Putih" (in Indonesian). Sajian Sedap. Retrieved April 1, 2014. ↑ "Bumbu Dasar Merah" (in Indonesian). Resep Kita. Retrieved April 1, 2014. ↑ "Bumbu Dasar Kuning" (in Indonesian). Sajian Sedap. Retrieved April 1, 2014. ↑ "Bumbu Dasar ala Chef Rudi Choirudin - Cocok untuk Ramadhan" (in Indonesian). Resepista. Retrieved April 1, 2014. Wikimedia Commons has media related to Spices of Indonesia.